Founder of Marauder Marine, Jerry Scott, thrived on new innovations. 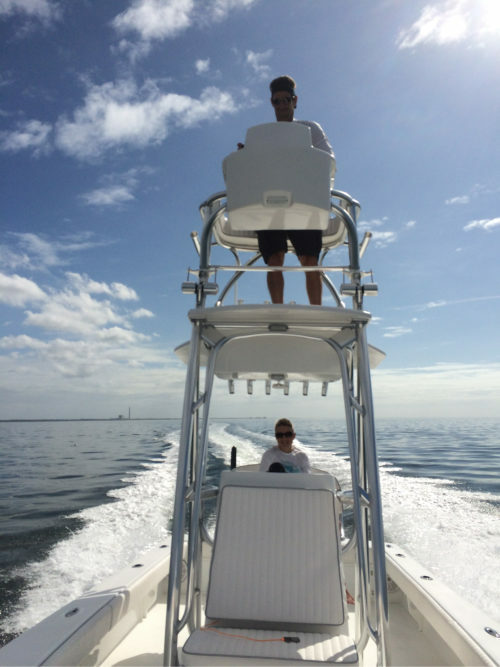 He was challenged to design a dry, soft riding, and fuel-efficient boat to navigate a shallow residential canal, run through the flats and travel offshore for sportfishing trips. Before Jerry finished the molds, current owner Dave Graham and friend Rodney Ristau ordered hull #2 and #4 respectively. Both fishing guides at the time, they realized the revolutionary design of the ventilated transverse stepped hull would provide a more comfortable dry ride and a stable platform for their customers experience. In 1998 the very first Avenger 24 was alive prowling the waters around Tarpon Springs fishing spots others could not reach. Jerry's Avenger instantly became THE must have fishing platform for fishing guides from Tarpon Springs to Charlotte Harbor and the Keys. Jerry, once again chasing innovation, took advice from trusted family and friends and designed the Avenger 25. Duplicating the unmatched hull design and ride of the Avenger 24 he created a more family friendly, self-bailing classic shear design. The 25 has higher sides for families with children and a taller bow for those rougher days on the water. These advancements triggered Jerry to optimize the 24 to include higher self-bailing decks, transom baitwell, stand-up anchor locker and multiple deck lockers. After many years of good boating Jerry sold the business to Rodney Ristau. Rodney provided a new spark of excitement to the shop and carried on Jerry's passion for improvements. Listening to our customers, Rodney redesigned the 25 to include key features of the optimized 24 by adding the transom baitwell and stand-up anchor locker. Sadly, we lost both Jerry and Rodney too soon in our collective voyage. Our lives are quiet without these two spirited personalities and we miss them greatly. Their legend lives on in the earlier hull #'s as well as our continued commitment to building custom boats that are truly handcrafted and finely tuned without equals or compromises. Dave Graham is a Florida native, raised in Crystal Beach and Tarpon Springs. David was born with fishing and boat building in his blood. Father Billy Graham, the co-founder and partner of Ross Yacht Service, a full-service boat yard formerly located in Clearwater Florida. David grew up in this legendary yard working on power and sail boats of all sizes from stem to stern from the bilge to tower. In 1987 David completed rebuilding his 1966 flat bottom 22' Aquasport. The "Redboat" complete with plenty of varnished teak was both pretty and functional. This boat design started a revolution in the builders market and back yard enthusiasts alike. For many years David fished his charter business with this boat until friend Jerry Scott designed the Avenger 24. Graham and family custom-built hull #2 mixing bullet proof construction and replicating classic teak features from the old boat. Overnight a new revolution was ignited. Guides traded their 1970's classics and 1990's reproductions for the innovative modern bottom design of the Avenger 24. At Marauder Marine it begins with only the finest quality materials without compromise. Our skilled craftsmen take great pride constructing every Avenger 24 and 25. From the first laminate to the final electrical connection we are focused on quality. Our customers have confidence the Avenger will bring them home for generations to come. Our custom fishing boats are designed for those who understand how being handcrafted and finely tuned is directly correlated to superior performance. Welcome to the Marauder Family! Build your boat.